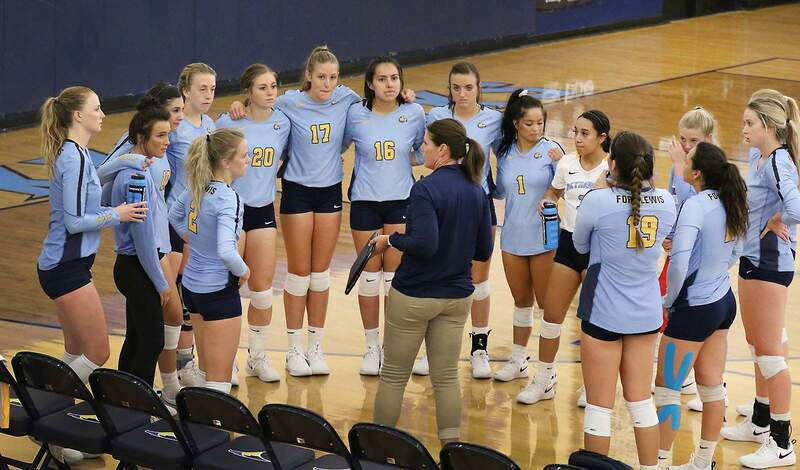 Tricia Melfy, head coach of the Fort Lewis College volleyball team, talks with her players during a time out during the alumnae game Saturday at FLC. The Skyhawks will travel Friday to Salt Lake City for their first game of the season against Westminster College. 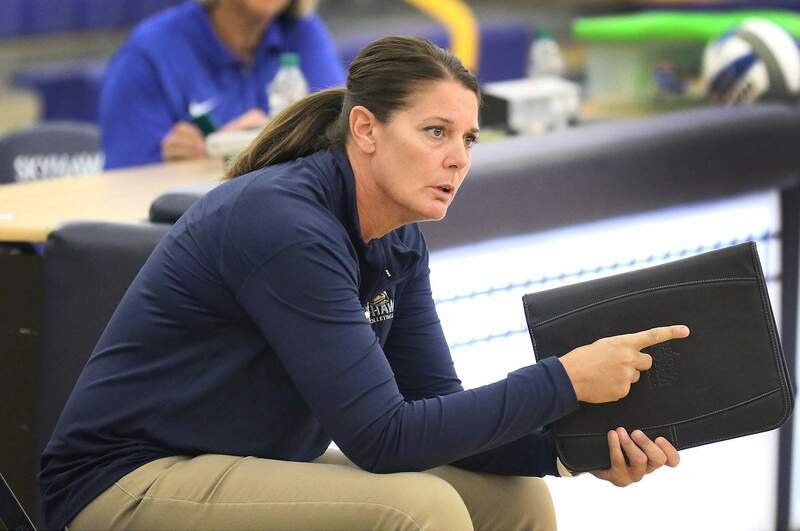 Fort Lewis College volleyball coach Tricia Melfy understands how demanding she is as a coach. Her players recognize it, too. For all the workouts, practices and exhibitions that have been put into the three-week preseason, the new coach and the Skyhawks are changing the outlook of the struggling program. Melfy has brought wholesale changes since she arrived in spring. After three months of being on her own, Melfy added an assistant coach and seven new players to a program voted to finish 14th out of 16 teams in the Rocky Mountain Athletic Conference preseason poll. The preparations have put Fort Lewis in a good spot heading into the season opener this week. The Skyhawks had two exhibition matches as tuneups to the regular season and split the results. They were swept by the University of New Mexico two weekends ago, but rebounded to sweep the alumnae team last Saturday. Fort Lewis College volleyball coach Tricia Melfy calls in a serve during the alumnae game Saturday at FLC. The Skyhawks look to reach the Rocky Mountain Athletic Conference tournament for the first time since 2011. Senior setter Kendra Swackenberg said the tuneups, along with coach Melfy pushing them in practice, has seen the program come together like never before. One change has been the sheer length of the preseason. It’s been three weeks instead of a week and a half worth of practices and workouts. The other change was playing Division I opponents. It’s the little things that are becoming cornerstones for the re-build of the program. Since Melfy has arrived on campus, she was mostly a one-woman show, doing everything from recruiting and scheduling to doing travel budgets. “It’s been a huge whirlwind... but there’s a lot to do that leads up to what we’re seeing today,” Melfy said. “To do that on my own was a little bit overwhelming, but also rewarding and exciting, so I embraced the challenge. The team has set a goal of being in the top eight in the RMAC this season, good enough to make the conference tournament – something the program has done only twice since 2010. The seven new players are already playing key roles. Outside hitter Ohiyah Shirley, a transfer from Northern Arizona University, is one who is expected to start, as is outside right hitter Haley Christiansen. Melfy said that, with all of the changes, the Skyhawks have handled the preseason and are ready for the season to begin. Fort Lewis will begin its season at noon Friday when they will take on Westminster College in Salt Lake City in the first round of the Westminster Griffins Classic.